How do yo get one? Simply by pledging $15* or more (please pledge more, if you can) to my upcoming Insane Charity Bike Ride! Wait. WHAT Insane Charity Bike Ride, you say? THIS ONE! The postcards look great, and the only way you can get one is by pledging! They’ll all be signed by me. They have to be, to be valid. And if you backed me last year, you’ll be getting TWO OF ‘EM! To say nothing of the fact that if we reach $5,000 in pledges, I do the ride with a Duck of Doom on my helmet again! Getting to $5,000 will be tough – any and all help spreading the word is appreciated. HELP HUMILIATE ME WITH A DUCK! Hold on…that sounds rude and awful. Anyway, you don’t just get a VERY RARE AND COLLECTIBLE, SIGNED MUNCHKIN POSTCARD! Oh, no, indeed. Every time a $500 level is crossed, I’ll be sending a free PDF of something to everybody who’s pledged anything, up to that point. 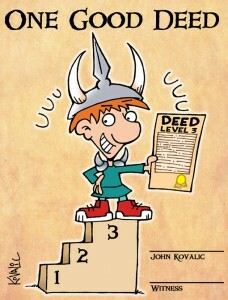 $5,000 Reached: EVERYONE GETS THE FULL PDF OF DORK COVENANT, the first Dork Tower trade paperback, 160 pages of dorky fun! And if we pass that? Then the fun really begins. 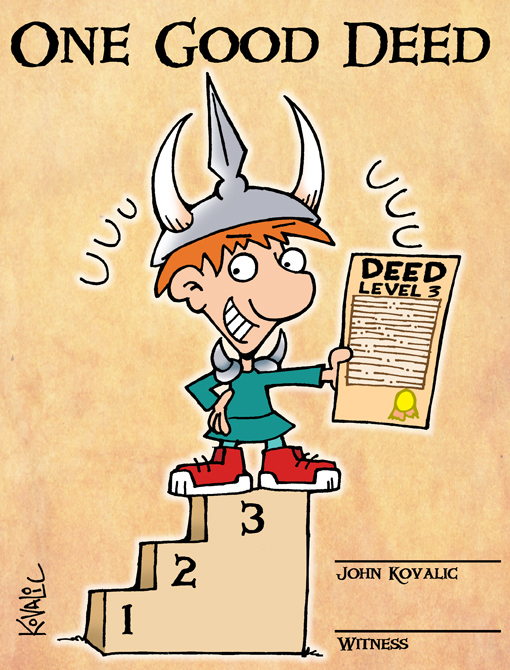 Also: The five top bidders will receive ORIGINAL ARTWORK that has appeared on MUNCHKIN CARDS. Also: Five other bidders randomly chosen at random will receive ORIGINAL ARTWORK that has appeared on MUNCHKIN CARDS. I don’t sell Munchkin artwork. I give it away. For charity. This is the only way to get a piece of Munchkin artwork. FOR REALS, guys! BUT THERE’S MORE! At the end of the campaign, everybody who’s pledged gets a free download of my very geeky “EMBRACE THE SQUEE” coloring book – with new pages added just for this year’s ride, including some fabulous Guest Artists. Narwhals and Rainbows and neon pastel glows! 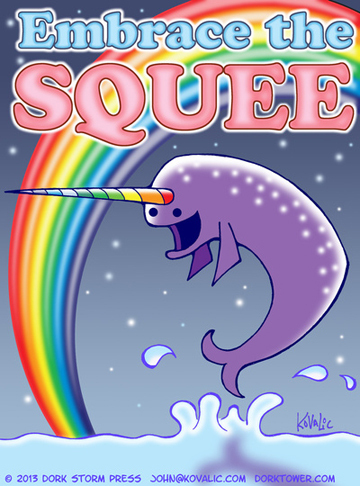 EMBRACE THE SQUEE! Look, if you can’t, no worries – I know money’s tight all around. But this is for a great local charity that I really believe in, and your donations do make a difference. Proceeds from Bike the Barns benefit FairShare’s Partner Shares program, which helps local low-income families purchase local, organic vegetables and have a direct connection with their food and farm through community supported agriculture. Last year the Army of Dorkness (i.e., you all) was the main fund-raiser for the ride. This year I’d like to try and do even better. PS: Super big thanks to DriveThru Comics for helping wityh all the PDFs! * UPDATE: There was a type that had this at $10. DON’T WORRY! Everyone who previously pledged $10 will still get this. ** Update: WE HIT ALL THE MARKS! We passed $5,000! To celebrate, everyone will get ALL the pdfs, regardless of WHEN you pledged!